A paper published in the journal of the Italian Astronomical Society finds that solar geomagnetic activity was highly correlated to global temperature changes over the period from 1856-2000. The authors "show that the index commonly used for quantifying long-term changes in solar activity, the sunspot number, accounts for only one part of solar activity and using this index leads to the underestimation of the role of solar activity in the global warming in the recent decades. A more suitable index is the geomagnetic activity which reﬂects all solar activity, and it is highly correlated to global temperature variations in the whole period for which we have data." This could be a really valuable paper - pity there is no link to the paper or that solar geomagnetic is undefined. Wow! A correlation to die for. But what has happened post 2000? Why is this missing? I have this crackpot hypo-theory that some warming of the oceans is caused by lateral currents in solar flares being directly coupled by the geo/helio magnetic fields "transformer" into the oceans. Sea water has the same resistivity as the resistivity of the flare "corona" (which is six orders of magnitude higher that the Spitzer resistivity)and therefore coupling is likely to be much higher (by the Maximum Power Transfer theorem). Note also that the skin depth of the oceans is about 300 metres and this effect would explain how global temperatures are buffer through solar minima. It is Landscheidt's missing heat and an additional energy input due to solar and geo magnetic field variations to that of Sevensmark's cloud mechanism. Note that this mechanism requires the presence of both solar and geo-magnetic fields. Reduction in the solar magnetic field causes colder climes like Maunders, Wolfe's and Daltons. The collapse of the geomagnetic field removes this effect entirely and will likely trigger a major glaciation. (the 514 is exactly 2 Hale cycles spanned running average). The question indeed is what happens then (there's the sharpest solar activity decline since the ending of the SC22 (end in 1996) - from SC22 SSN average 80.9 to current SC24 average 34.4. And the temperature trend since then stalls in most of the global composites. There are also sharp downward TSI trends of about ~0,7-1W/m2 derived from PMOD using L. Svalgaard correction based on TIM/PMOD correlation. I'm just a layman, but we try to debate what does it all mean. Methink that there is a transient lag of about one solar cycle due to the partial cancelling effects among the rise and descent periods of the solar activity during the cycle, latent heat intervention during the energy imput trend reversal and resulting change of the wind and ocean stream patterns compressing then the excess heat down through the polar thermocline due to the dilatometric anomaly leading to partial melting and dissipation of the heat into the latent heat and deep ocean reversing gradually the temperature trend if the solar decline continues leading then back to sea ice rise, neverending quest for new thermal equilibrium etc. -Something like the transient effects of the seasonal variation with the typical quarter of year lag at the places where the temperature goes below zero in winter - on a bigger scale. My naive ideas. He still thinks, the solar irradiance has just a minor effect on the temperature trends, but doesn't exclude other celestial factors as Jovian cycles, GCR etc. Nothing to worry about, time will tell. The paper is dated 2005. Why is it only now comming to light? 1. It was published in an astronomy journal - unlikely that climate scientists would have read it. 2. It was published pre-climategate, when many trusted the IPCC's dismissal of any significant solar influence on 20th century climate. You might find these items fit pretty well but are not the only articles touching the magnetic linkage. The comments wander off in other directions, hurding cats. I'm interested but feel I understand little. My opinion is the solar/terrestrial linkage is strongly magnetic related, the details, mechanism is the key we need. How exactly does it work? Hazarding a guess one is cloud related but there are other effects to do with the high atmosphere. Ignore the first plot, not really related, done for a pretty picture. Great post! Thans a lot! The mechanism by which the geomagnetism would directly influence climate is that high geomagnetic activity deflects cosmic rays and reduces cloudiness. This proposed mechanism has not been confirmed by cosmic ray observations versus cloud cover. 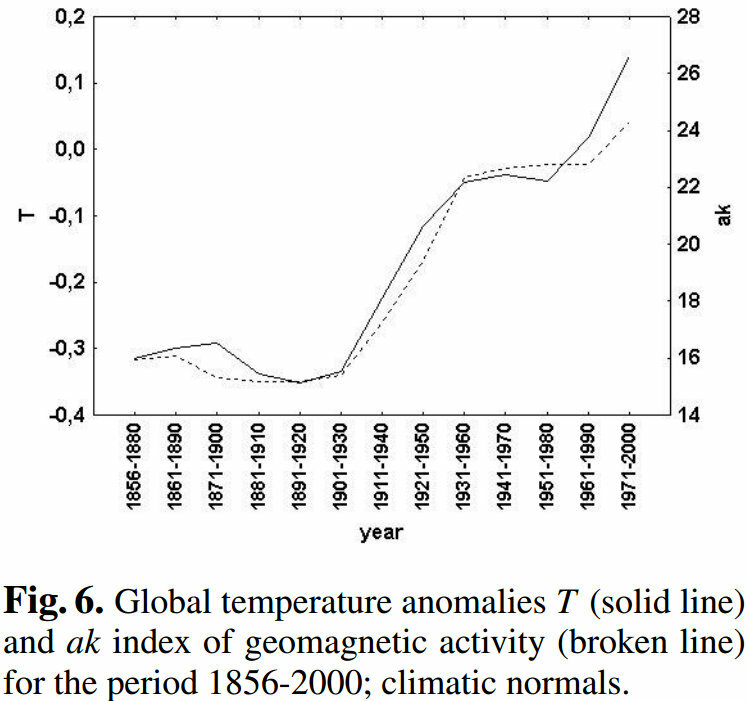 Also, it would appear that while all of the warming during the period between 1920 and 1960 is linearly proportional to the magnetic index ( and to the sunspot index as well) the coefficient of proportionality appears to decrease to one third of its former value after 1980. So if this mechanism existed it would only explain about 1/3 of the warming. In addition, actual measurements of cosmic rays show no increase since 1980. By using geomagnetic proxy, the authors are endorsing the idea that cosmic ray suppresion by the sun's magnetic field, reduces cloud cover and warms the planet. The problem with that idea is that no relation between cosmic rays and cloud cover or cosmic rays and temperature has been found. In addition, the ratio of temperature change divided by change in solar geomagnetic activity for the period between 1980 and 2000 is reduced from its value between 1910 and 1940 by a factor of about 3. 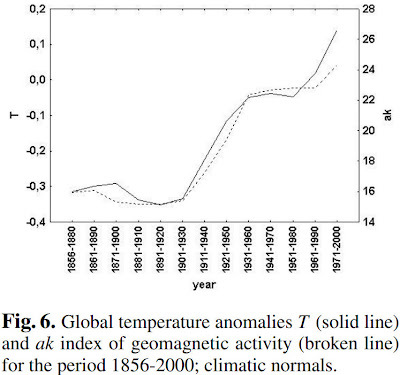 This indicates that at best 1/3 of the temperature change during that period is attributable to geomagnetism. It seems more likely that there is something wrong with this paper. It is old, and but hasn't been cited by climate researchers, probably for a good reason. "So if this mechanism existed it would only explain about 1/3 of the warming." Let me clarify my comment, because it seems that I didn't express myself accurately Between 1910 and 1940 the temperature seem to change by 0.4 C for a 7 units in ak (the solar geomagnetic activity). Between 1980 and 2000 the ratio of temperature increase to ak increase seems to be a factor of 3 larger. The authors don't seem to notice this, and don't propose an explanation for why the coefficient abruptly change if this was the principle driver of temperature change throught the period. This is also the period when GHG's were supposed to be the important driver of climate change. This would indicate that geomagnitic activity is not quite the driver that the authors claim. In addition, since geomagnetic activity is supposed to act on the climate through cosmic ray suppression, and no substantial decrease in cosmic rays activity was found during the period of temperature increase, the premise of their paper seems to be questionable. The human imagination needs to be supplemented with a mathematical method in order to detect what is influencing a variable like global average temperature, or ocean heat increase. . The method most scientists would use first is multivariable regression, clearly superior to the handwaving arguments used so often by bloggers pushing a point of view. A number of papers have been written about this. For independent variables, they have used ocean cycles such as ENSO and AMO, which oscillate and change the temperature of the sea surface, volcanoes which impact the amount of sunlight reaching the earth, and solar activity. When these effects are accounted for in the global temperature versus time, we are left with the residual caused by human factors. No matter which temperature data set you look at, you get a steady increase of 0.2C/decade. It seems that all the natural factors have done is produce noise in the global warming signal. which may have also been solar mediated. Need to use the time integral of solar activity to properly evaluate cumulative solar energy anomalies.